Get ready for the Ontario Walnut Bar Stool Cream, a trendy design that’s guaranteed to please. Suitably fixed at the ideal height for standard kitchen worktops, the Ontario Walnut Bar Stool makes a fantastic modern item out of traditional materials. Designed with your comfort in mind, the plush cream faux leather seat is sumptuously cushioned, bringing a touch of luxury to the most generic of rooms. 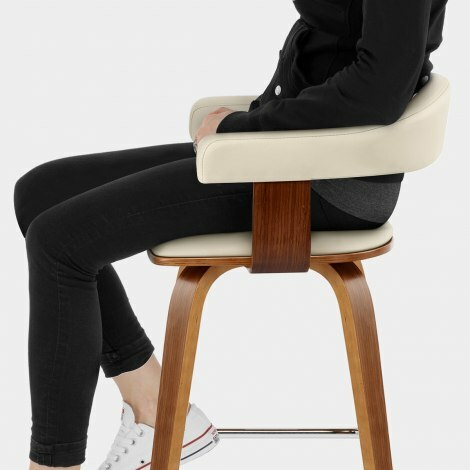 Encompassing the body, the combined back and armrests deliver optimum support, with a fashionable segment gap creating an enhanced sense of space. Set on a solid wooden frame, the tapered bentwood legs boast a rich walnut finish and are connected by a square chrome bracing bar that acts as a handy footrest. With protective plugs concealed beneath to help minimise scuffing to floors, these are also adjustable to ensure the Ontario can be used on uneven surfaces. "Quality, very sturdy, very good price, very comfortable"
Quick delivery. Easy to assemble. Good quality. Perfect for our kitchen. Exactly what we were looking for to complement our new breakfast bar. Arrived as promised quick delivery. Ordered Saturday arrived Monday. Eager to assemble good instructions. Looks amazing . Good quality, just the right size for our island breakfast bar. Totally happy. Bought these to sit at our new bamboo bar and they look fabulous. well made , easy to assemble. They have already had lots of admirers! Very quick delivery. Lovely quantity, exactly what we were looking for.